Wow! My first book came out in 1999. I’d love to be able to say that writing has gotten easier, the publishing community more open and friendly, editors and agents knocking each other down to find and publish new writers . . . but I’d be telling a bit of a fib. Actually, a whopper! In sixteen years, writing, publishing, and staying in the game has become very difficult. For starters, Indie bookstores were my mainstay way back when. I signed at wonderful small mom and pop stores across the country. Even as a newcomer I was able to draw crowds of fifty people or more and sell a like number of books. They got the word out in newsletters and posters and word of mouth. I even dedicated a book to those Indies who supported me. Last week I heard that my favorite Indie, Moby Dickens Books of Taos, New Mexico had closed its doors. Just one more of hundreds. And even though I’d characterize myself as someone never living in the past, I admit to a sadness and longing for something that will never be again. Of a consequence book signings have taken on a new “look”. Not so much the cozy glass of wine and nibbles while you draw deep-cushioned chairs in a semi-circle for a somewhat intimate discussion of your masterpiece. If a writer chooses to sign in the flesh, he or she is often given a card table by the door in a warehouse-sized store and must “hawk” his wares. Not fun and not very productive! So, what’s the alternative? Where do we find an audience? There are probably not that many fewer readers today—though I could make a case for the age demographic to be creeping up a bit. Mystery readers especially seem to over fifty. If you want to “press the flesh” and talk with real people, I’ve found book clubs to be a goldmine—followed by libraries, holding workshops and blanketing the earth (especially art galleries) with flyers and announcements. I just moved to Florida from New Mexico and have had to establish my “reputation” all over again. Of course, I’ve saved the biggest audience until last. The vast, faceless, nameless hordes that frequent Amazon and live by social media. The blogs, twitters, dedicated Face Book pages, not to mention personal web sites and virtual book tours . . . this is a writer’s audience today. You hear stories of name authors turning down a NY publishing contract to self-publish. Very lucrative if you are established. And the E-book . . . I’d be the first to say I live and die by my Kindle. And I’d be the first to say that I’ve needed help getting up to speed “electronically” . . . webinars, local web gurus—and just about any book for dummies on a pertinent web topic that I can get my hands on have helped get me up to speed. And then an interesting thing happened. Thinking I was writing about Greyhounds because I like dogs and Florida just happens to have over fifty per cent of all dog racing tracks in the US, Hair of the Dog, the latest Dan Mahoney mystery, has developed quite a following among greyhound rescue groups—an entirely unexpected audience! I have the first of several track signings beginning next week. It’s old, but tried and true—take your subject matter to the subject! 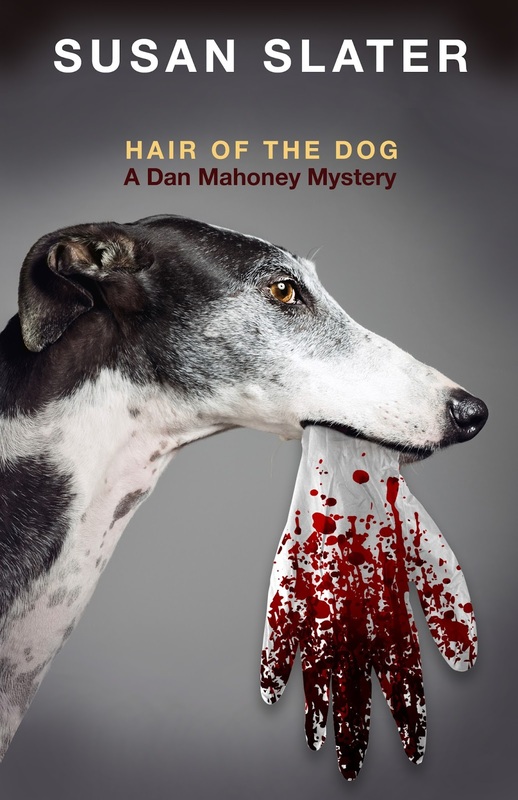 I’m hoping racing fans will be drawn to the cover of Hair—a particularly gorgeous head shot of a greyhound holding a bloody latex glove in its mouth. Ah, the mystery beckons. 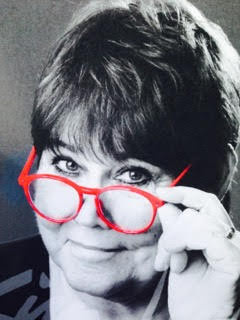 Susan is the author of the Ben Pecos series (Pumpkin Seed Massacre, A Way to the Manger, Yellow Lies and Thunderbird), a stand-alone (Five O'clock Shadow), a women's fiction novel (0 to 60), a para-normal short story in Rod Serling's commemorative Twilight Zone Anthology (Eye for an Eye), and the Dan Mahoney series. Susan lives on the Atlantic coast and writes full-time. It's always interesting to get to know a little more about the authors of the mysteries we read. And this series sounds like an intriguing one! Thanks so much for featuring her today.